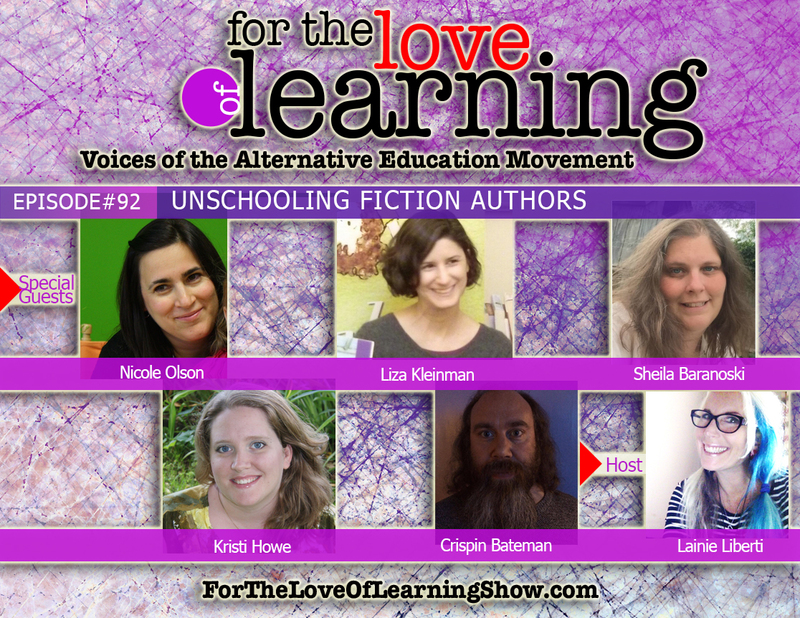 On a recent episode of For the Love of Learning, the topic of fiction books, with self-directed learners as the main characters was discussed. The entire panel agreed that there is a great need for more fiction books with characters that homeschooled and unschooled kids can identify with. So, we put together a panel of authors who are doing just that, writing and publishing books with self-directed kids as the protagonists. An unschooling mother of four, Nicole Olson is the author of A Pair of Sparkly Sneakers: A Mother’s Journey to Inner Wisdom which chronicles her transition from traditional parenting to unschooling. Her children’s book series Ippie looks at unschooling from a child’s perspective. Nicole has also authored several other children’s books and is the voice behind the blog unschoolers.org. Currently, Nicole enjoys working with her local church, using elements of unschooling philosophy to help children and adults connect around faith in a purposeful way. Before becoming a mom, Nicole held certifications in elementary and special education and taught in a variety of capacities and grade levels. Sheila Baranoski is an author of two fiction books, Cellular Spirits and Miss Crazy, as well as a nonfiction book that explains unschooling to concerned friends and family: Dear Grandma: Your Grandkids are Unschoolers. Liza Kleinman is a freelance writer who lives with her husband and daughter in Portland, Maine. Her fiction has appeared in several literary magazines and in the anthology Writes of Passage: Coming-of-Age Stories and Memoirs from the Hudson Review. For her first novel, Azalea, Unschooled, Liza approached the subject of unschooling as an interested outsider. She is currently working on a second novel. Kristi Howe has been writing books for fun ever since she learned to hold a pen. She took time off from her hobby when her first daughter was born. By the time her second daughter was born she began the search for books about unschooling. Kristi wanted a sweet book about the lives of unschoolers that was relatable to the life her and her family share, This was how book 1 of the Unschooling Adventures series was started. Kristi lives with her husband Ken and two amazing, unschooled daughters in New York. Life in New York has provided many learning opportunities for Kristi and her family. To allow for even more natural learning possibilities Kristi and her family also spend a lot of time traveling the country and learning as much as possible during their trips. Kristi’s desire is for families to be able to identify with the characters in these stories. To see that there is a peaceful, fun, loving and authentic way to connect and teach your children even on an ordinary day. Crispin Bateman is father to four children and has been home educating them their whole lives. A professional writer, Crispin focuses on home educated characters in his children’s fiction because he not only believes in “writing what you know”, but also wanted to provide his own children with relatable protagonists. His fantasy series Tales From Uun uses home and alternative education as a central theme that develops throughout the stories and features exclusively home educated main characters. Crispin currently lives with his long-suffering-yet-supportive partner and their family in Wales, but has developed a keen interest in world schooling and plans to expand his family’s horizons over the next few years.